A number of things have started happening around here. I've been sewing like a crazy person and just making, making, making. Feels good. This is another McCall's 6649 pattern hack. Don't believe me? Let's start from the neck down and I'll give you the play by play here. If you're wondering what you can do with a basic pattern - like McCall's 6649 - well, I'll be here showing you what I do. If you're interested, I took this class on Craftsy - One Pattern, Many Looks with Sarah Holden. Highly, highly recommend. It's about pattern drafting, and getting the most from a TNT (tried and true sewing pattern). It's a class that I would definitely recommend for anyone. It's just really good and it helps you think outside the box instead of thinking that a shiny new sewing pattern is the answer. Not saying that it wouldn't be the answer, I'm just saying that before you go fit-fighting with yet another sewing pattern, you might be able to create something similar by using a pattern that already fits you! Soapbox officially ended. So, some more things you should know. I have a ton of lace leftover from my brick and mortar shop and I thought to myself, just cuz it's ivory and white does not mean that you can't use it for something that is not a wedding. And I made this top especially to go with jeans. No joke. The hemline length and style were meant to be worn with my jeans. I didn't want it too over the top, but I'm into bling if I can get away with it and this is one of those times where I'm pretty sure I did. What do you think? That said, while I'm loving the style and beauty of this blouse, I don't know that I feel this color does me any favors. Looks very much like my skin tone - but I'm still going to wear it! With pride! This seems to be an art deco inspired lace (re-embroidered lace with beading and sequins). I paired it with a silk charmeuse that I had, and then also made the sleeve from a matching double georgette. Fancy, huh? To be honest, this is one of those types of blouses that I tell everyone else to make all the time and then never do it myself. I've seen this sort of trend a lot - having the blouse front be a different fabric (or lace overlay) from the back - and since I have a bit of lace myself, I thought it would be great to try. I made my jeans too. They are a rub-off from the jeans you've seen me in in a few of my lasts posts. I pilfered the back pocket from Closet Case Files awesome Ginger jeans and then I followed several of Heather's tutorials and insights into jeans via her Ginger sewalong. She did such an amazing job with that which is no surprise. I have plans to try the Gingers in the not too distant future. They look pretty awesome on everyone I've seen make them so far. Well, that's it for today. Have you ever worked with lace? This is a gorgeous blouse and I have been following along on your Instagram and have been loving the look of this blouse. Also, I cannot believe it is from the McCall's pattern. Looks beautiful! I definitely want to try lace on a top sometime in the not too distant future. I made a raglan tee (S1317) for my daughter with a lace overlay in front. I want to make lace shorts for summer. Think they'll transition nicely from casual to dressy! Love your top! It looks so delicate but not "hard" to wear. Very nice jeans. You did beautiful job on this blouse, Sunni!! Makes me want to be more "think outside the box" and modify existing patterns to make something dreamy. I've not done much with lace (always feel like it has to be worn to an "occasion" and don't have too many of those) but you nailed it. I love jeans that can be dressed up or down depending on the mood, the day, the party, whatever. Beautiful blouse! I think the color looks very nice on you. I took that same Craftsy class a while back and loved it as well. I'm looking forward to making lots of different blouses when I have more time. Funny you should mention lace...right now I'm knee-deep in bridal fabrics, lace included, as I sew my daughter's wedding gown and all of the bridesmaid's dresses. Yikes. Thanks for sharing your projects! I saw your Instagram pics of this in progress and thought it was so lovely, and it looks even more beautiful on you :) The colour is soft and subtle, and a good shade for your skin and hair - and the details are really amazing - I totally love it with jeans!! Wow. Just. Wow. This is really beautiful. I liked what I was seeing on Instagram but now I am besotted right along with you. Really stunning. Love the top AND the jeans. 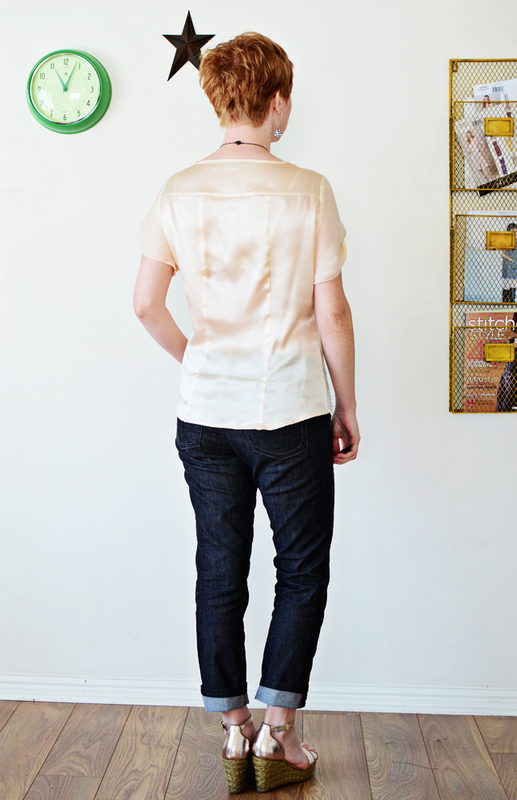 The Craftsy shirt class has been in my wish list forever and your hack made me just move it into my cart. Would you be able to share where you got the denim for your jeans? It looks nice and dark and just perfect! Hard to find denim that looks RTW like this does! Thanks for all you do. You are such an inspiration! This blouse is beautiful! I love tops like this paired with jeans. 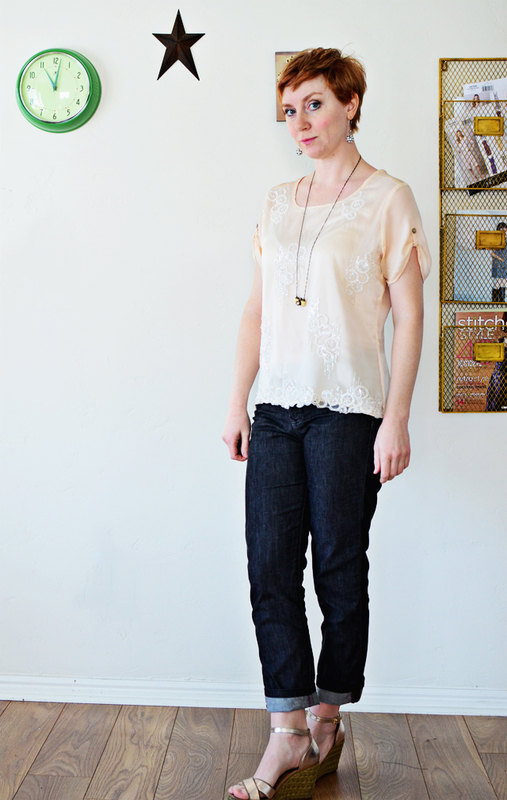 I keep wanting to incorporate lace into a blouse, but I always shy away from it... Oh, and great jeans too! This is such a lovely blouse. The colour actually looks to me like your perfect neutral. It matches your skin tone but it doesn't drain you or leave you looking tired...just highlights your peaches 'n cream complexion. 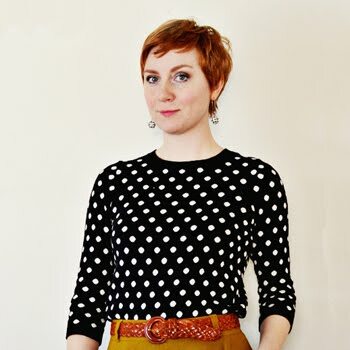 Your blouse is really beautiful and you have inspired me so much, I have enrolled in the Craftsy class. 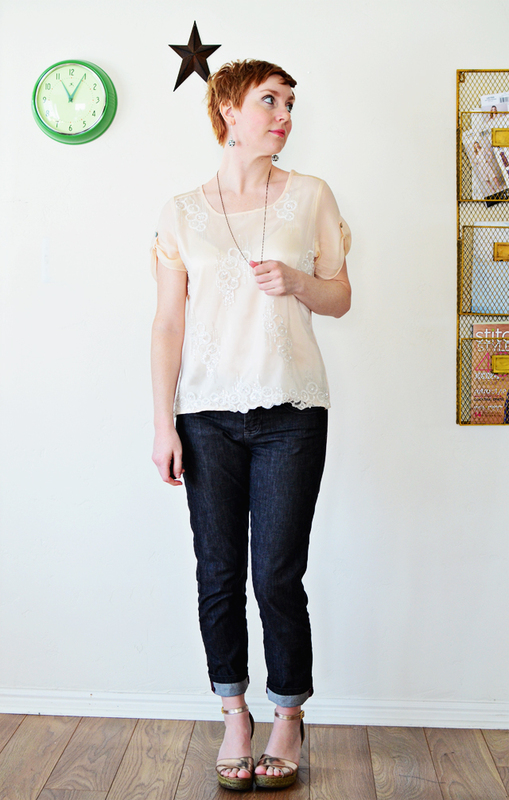 The lace combination is very 'in' and I personally love the mix of 'delicate with denim' - could be a new fashion term! Thank you for your posts. That blouse is absolutely gorgeous! I would buy that in an instant (like elbow other ladies away from the rack) and then wear it to death. 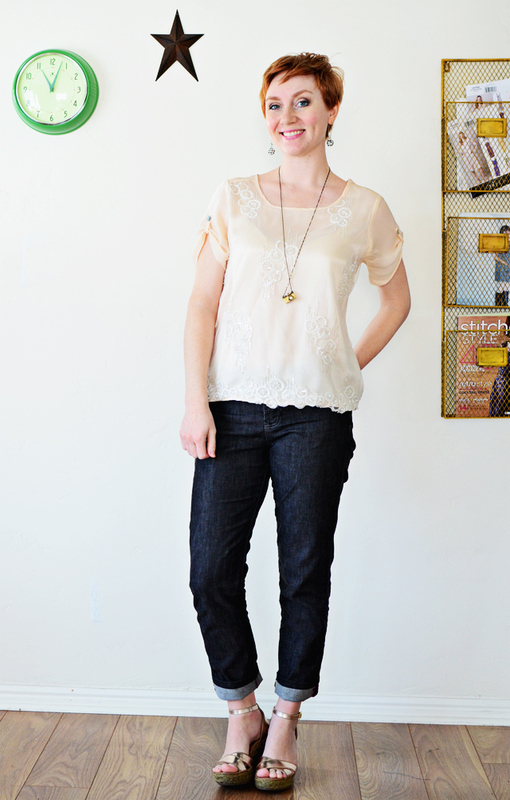 I pair lace & denim ALL the time - but we do that here in Texas. Sewing lace? Not so much. When I see sheers, I go down the other aisle. Love. I have a piece of blue lace and matching silk. I was planing a sheer top and Cami but I may try your way instead. Thanks for the inspiration. The top is cool, but I'm digging those jeans even more! Weird since I don't even do jeans ... but I love the denim you chose and the fit is great on you! Sorry about your bad news, but I'm glad you're finding your way through it. Making, making, making always helps me get through the tough times. What a gorgeous top! It's so beautiful! And your jeans look perfect! Also... THOSE SHOES! I love your top. I've just finished this course online and it is highly recommended. Your jeans looks awesome i loved it. Your jeans looks awesome i love this color. I can see why you are besotted! It's beauftiful. By the way the color of the blouse in these photos make your skin look a lovely and delicate pink. I think it's perfect.